My nomination for the crappiest camera ever. Seriously, it is truly awful; more money was probably spent on the color advertisement here than on the camera itself. The back is just a plate that kind-of closes the back, and it's held in place with a slide-latch that almost holds it in place. The film channel is warped. The lenses, though I don't know this for a fact, I believe are single-element, which would explain their claim to having "less reflection and deflection." What's worst about this thing may be the dual, unsynchronized shutters. That's right—you have to trip each shutter independently (note the two buttons). They couldn't figure out how to call that a feature in the ad. Lastly—it takes 828 film; everything that was bad about 35mm and none of the advantages. The sad part is that thing was in the vanguard of the post-war stereo fad which would take hold in a couple years. 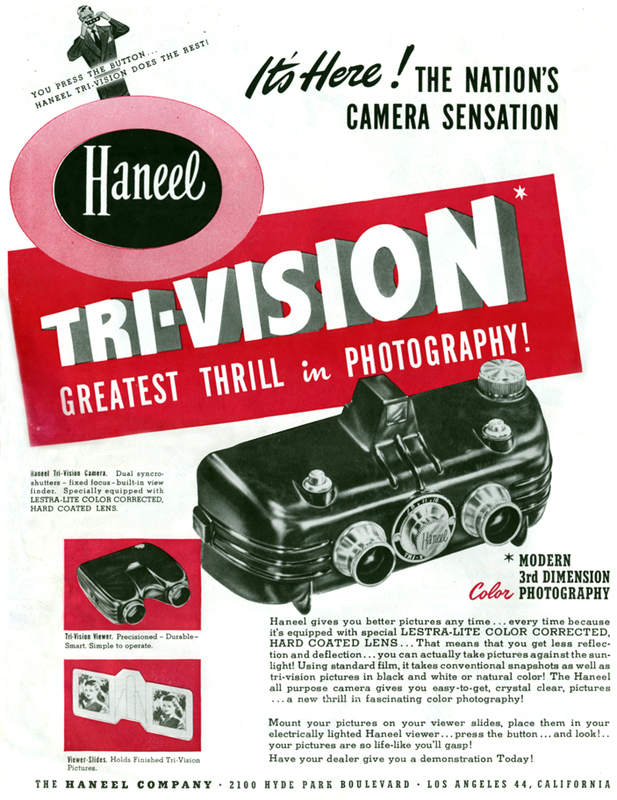 Except the fad was led by the Stereo Realist, which was a quality camera. This thing didn't last too long. This is the only ad I've ever seen for it, and the only mention of it I've ever seen in a magazine of the period. Every once in awhile I see one of these at a junk antique shop for some ridiculous price, and I just laugh.